these are some of many which you find in this country. If you want to know more about Australian grapes, send me an e-mail. Should you be interested in one or the other vineyards listed above, please send us an e-mail or give us a ring. If you are looking for rare Vintages from Penfold ( Grange ), Henschke ( Hill of Grace ), Lehman, Clarendon Hills Greenock Creek , Two Mills Creek, Fox Creek Parker or any other - please get in touch. SIMON HACKETT " Vineyards "
Situated eighty kilometres north of Adelaide in the Barossa Valley, there are two vineyards from which I source fruit. The Brightview vineyard is located in what is termed ' the valley floor ' between the townships of Tanunda and Nuriootpa. This vineyard yields Semillon from two separate plantings. One plot was planted in the 1950's, the other from Semillon cuttings grafted onto Riesling root stock. I believe this root stock enhances the wine citrus flavour. The second vineyard is situated near the township of Angaston. Here I am lucky to have a small vineyard which was planted to Shiraz vines in the 1890's. From these very low yielding but ex-tremely high quality bearers comes a limited release single vineyard wine. I have four vineyard sites fifty kilometres south of Adelaide. The largest vineyard, just west of the township if Willunga, was planted in the early 1990's to Shiraz, Cabernet Sauvignon and Grenache vines. Further east, in the foothills of the Willunga Ranges and nestled between rolling hills and aged gum trees, I source Cabernet Sauvignon and Shiraz from vineyards planted in the mid 1980's. Closer to the township of the McLaren Vale I take Cabernet Sauvignon grapes from vines planted in the 1960's. Further east towards the hamlet of McLaren Flat I have Grenache vines planted in the 1950's. Nearby is the legendary Foggo Road vineyard planted in 1924. Only small quantities are harvested from the low yielding Cabernet Sauvignon vines. Situated fifty kilometres south east of Adelaide in the cool region of the Adelaide Hills I haveestablished a ten acre property planted to Cabernet Sauvignon and Shiraz . This low yielding, cool climate vineyard is designed to grow high quality grapes. I look forward with greatexcitement to our first vintage year. SIMON HACKETT " The Winemaker "
The Simon Hackett story goes back well before the establishment of Simon Hackett Wines. Four generations of the Hackett family followed agricultural pursuits in South Australia. In 1860, Simon's great uncle attended the esteemed Roseworthy Agricultural College whilst Simon's father was a graduate in the inaugural Oenology Course at the college in 1938. Simon grew up in an atmosphere steeped in wine, spending his boyhood in the Barossa Valley Distillery, Tarac International. The family home was situated next to the sprawling Saltram Winery outside Angaston. Given this environment, it was not surprising that Simon, at the age of eighteen, elected to follow a career in winemaking and joined the team at the neighbouring Saltram Winery. Serving his apprenticeship under the watchful eye of master winemaker Peter Lehmann, Simon progressed through the ' Saltram's Ranks '. In 1970 he completed a vintage in the Hunter Valley Region of New South Wales, before returning to the Saltram Winery for an- other two years. In 1973 Simon decided to move to McLaren Vale thus his association with the region began and continues today. Simon's first Vintage in McLaren Vale was at the Southern Vales Co- Operative Winery, where he worked with the outstanding winemaking team of Grant Burdge and Ian Wilson. 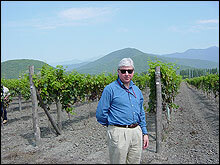 After eight years he was appointed Senior Winemaker at Southern Vales Coperative Winery, now known as Tatachilla Wines. In 1984, Simon decided to leave Southern Vales Winery and concentrate fully on establishing his own boutique winery situated in McLaren Vale. Once out on his own, Simon re-established his links in the Barossa Valley and today crushes grapes grown in McLaren Vale, Barossa Valley and the Adelaide Hills regions of South Australia.